One of the most remarkable women in modern Irish history is to make her first visit to the U.S in this month. Sr Consilio Fitzgerald SM, who founded `Cuan Mhuire' ('Harbour of Mary') in 1966, is one of the pioneers in the treatment of addictions. Sr Consilio's unique contribution to the rehabilitation of individuals suffering from addiction, spanning almost 50 years, is reflected in the numerous professional and civic awards she has received over the years. She is scheduled to speak at a number of events in Boston, beginning the October 8th. She will meet with parents, families and educationalist who are dealing with alcohol addiction and substance misuse. She will meet with business and political leaders. Sr Consilio will also share her unique experience of peace-building in Northern Ireland during her two week visit. The burden of alcohol and drug addiction in Ireland is greater than ever. Every night, some 3000 beds in acute hospitals are taken up by addiction- related syndromes. Cuan Mhuire is, by far, the largest multi-site provider of detox and rehabilitation services across the Island of Ireland. Cuan Mhuire's - in Athy, Cork, Limerick, Galway and Newry - are supported by 'Transition Houses' which provide aftercare, facilitate AA/NA/GA and other self-help meetings as well as temporary sheltered accommodation. Cuan Mhuire's internationally-accredited 'Care Model' is wholly inclusive. Cuan Mhuire is a Charity and, like other voluntary bodies, is under the cosh in an Ireland fallen on traumatic times. This has not deterred her from undertaking epic initiatives to make 'Best Practise' rehabilitative care accessible to all, most recently in the development of a wholly new centre in Newry, just over the border. 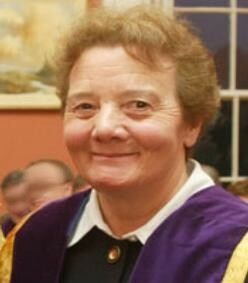 In 1984, at the height of the sectarian violence in Northern Ireland, she established the first Cuan Mhuire in Northern Ireland, in the border town of Newry. The extent of Cuan Mhuire's contribution to peace building and reconciliation in Northern Ireland has been acknowledged by the Irish and British Governments. But it wasn't what she and her helpers and volunteers set out to do. Their aim was simply to provide a facility where the distressed and the homeless —regardless of their background --could really experience 'home' and what it was to find refuge in the 'Harbour of Mary'.